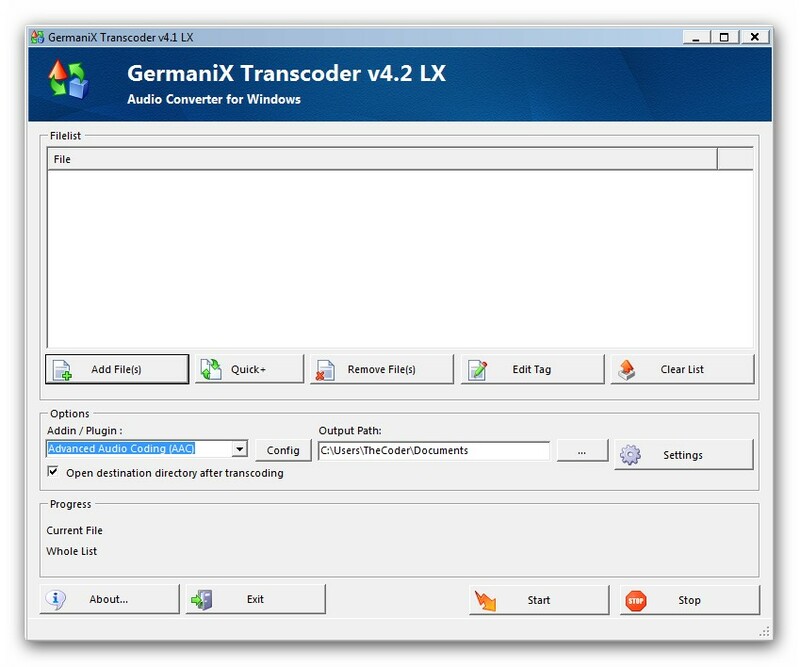 GermaniX Transcoder is a simple and extensible audio converter. It comes with more then 30 formats, more then 20 languages, more then 20 skins and is simple extensible trough a simple .net API. There is a new version @ http://www.gxdownloads.net. The last version I found is the 8.4. Very buggy software, it crash often during conversion, and the interface is a just ugly. 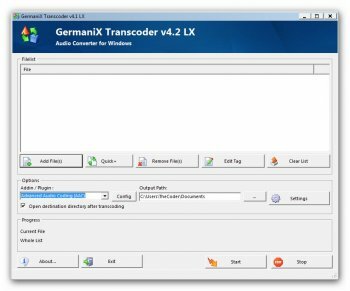 I prefer FormatFactory, it support the same input/output formats of GX::Transcoder, the interface is much more friendly, it's pretty solid and stable and is also free. It has nothing to do with V5 being a neverending beta; it has been buggy and cumbersome since its first release a year ago. Heck, even Winamp 5 has a much better transcoder (which is simple and fast to use at that). Nice work. Have some bugs, but is a beta. Post your bugs on the website of the author - it's a beta. Player have a verry slow start - but have a good interface. A help file is missing for the user. What happened to GX Tanscoder? V4 was far from perfect, but it was so much better than V5. This new version is slow, buggy as hell and totally unintuitive. Everything seems to run slow. Player cant see more than 2 folders deep!!?? Even though the transcoder can...?? Couldn't play most of my music files as a result. Couldn't get it to open mpeg for tranz to mp3 !!? Seems to open only basic audio file types. Even if this thing worked it is ridiculous to take out 20Mb of HD for the functionality it has. Anyone looking at this should look at AIMP2 which is primarily a player but has excellent transcoder, recorder, library, tag edits etc. as utilities and takes out about 7Mb of hard drive. Something definitely wrong here because I really think the GxTranscoder of about 2 years ago was much better than this junk. It's getting worse over time. Aah, I get it... You acquired Awave "for free" (wink wink) and thus, of course, price can't be the point, right? It might make sense for you, but personally, I wouldn't trust someone who can't even spell correctly his own nickname (don't whine, you asked for it). point is the gui is ughh. A comparison of gui's has nothing to do with developer, price, or lack thereof (dimwit). Awave Studio is 100$, GX is free. Your point? Before complaining about this and that, look at the homepage with addins, plugins, FAQ, forum, language files and so on. Does it convert .flv files to .avi? and vice versa - does it do .avi to .flv? Can't speak for the interface but it should be more like Awave's, or even multi frontend's would be better.